Scientists at Tokyo Institute of Technology (Tokyo Tech) have developed and analyzed a novel catalyst for the oxidation of 5-hydroxymethyl furfural, which is crucial for generating new raw materials that replace the classic non-renewable ones used for making many plastics. It should be no surprise to most readers that finding an alternative to non-renewable natural resources is a key topic in current research. Some of the raw materials required for manufacturing many of today’s plastics involve non-renewable fossil resources, coal, and natural gas, and a lot of effort has been devoted to finding sustainable alternatives. 2,5-Furandicarboxylic acid (FDCA) is an attractive raw material that can be used to create polyethylene furanoate, which is a bio-polyester with many applications. Many of the catalysts studied for use in the oxidation of HMF involve precious metals; this is clearly a drawback because these metals are not widely available. Other researchers have found out that manganese oxides combined with certain metals (such as iron and copper) can be used as catalysts. Although this is a step in the right direction, an even greater finding has been reported by a team of scientists from Tokyo Tech: manganese dioxide (MnO2) can be used by itself as an effective catalyst if the crystals made with it have the appropriate structure. The team, which includes Associate Professor Keigo Kamata and Professor Michikazu Hara, worked to determine which MnO2 crystal structure would have the best catalytic activity for making FDCA and why. They inferred through computational analyses and the available theory that the structure of the crystals was crucial because of the steps involved in the oxidation of HMF. First, MnO2 transfers a certain amount of oxygen atoms to the substrate (HMF or other by-products) and becomes MnO2-δ. Then, because the reaction is carried out under an oxygen atmosphere, MnO2-δ quickly oxidizes and becomes MnO2 again. The energy required for this process is related to the energy required for the formation of oxygen vacancies, which varies greatly with the crystal structure. In fact, the team calculated that active oxygen sites had a lower (and thus better) vacancy formation energy. To verify this, they synthesized various types of MnO2 crystals, as shown in Figure, and then compared their performance through numerous analyses. Of these crystals, β-MnO2 was the most promising because of its active planar oxygen sites. Not only was its vacancy formation energy lower than that of other structures, but the material itself was proven to be very stable even after being used for oxidation reactions on HMF. The team did not stop there, though, as they proposed a new synthesis method to yield highly pure β-MnO2 with a large surface area in order to improve the FDCA yield and accelerate the oxidation process even further. “The synthesis of high-surface-area β-MnO2 is a promising strategy for the highly efficient oxidation of HMF with MnO2 catalysts,” states Kamata. With the methodological approach taken by the team, the future development of MnO2 catalysts has been kick-started. 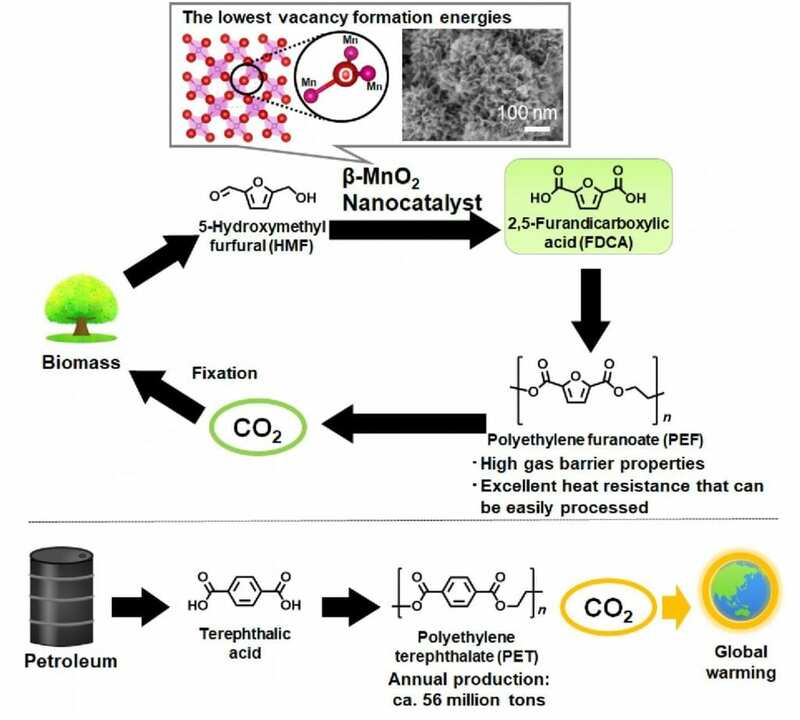 “Further functionalization of β-MnO2 will open up a new avenue for the development of highly efficient catalysts for the oxidation of various biomass-derived compounds,” concludes Hara. Researches such as this one ensure that renewable raw materials will be available to mankind to avoid all types of shortage crises.